All of the presets are based on the template color scheme. But perhaps you like one effect, but it is not in the needed color – here the subtle gradient and subtle reflection are the effect desired. But what is really needed is a blue gradient. Instead of going in and manually setting options, I can apply the preset effect (shown above), then open the manual settings dialog and just adjust the colors to achieve the needed graphic. One of the nice features is the new preset effects. Once text is selected you can use any of the preset visual effects to easily add a dynamic look. Just like a shape, an image can be used for the fill on text. Here is an example where I selected the text desired and filled with an abstract image that becomes further abstract by being stretched across the width of the selected text and compressed to just the height of the text. Just like previous examples, this remains editable text and is applied to select text within one text box. I showed this effect earlier – but it is definitely worth looking at again. Here I have applied a gradient fill to the two key elements of the text box. 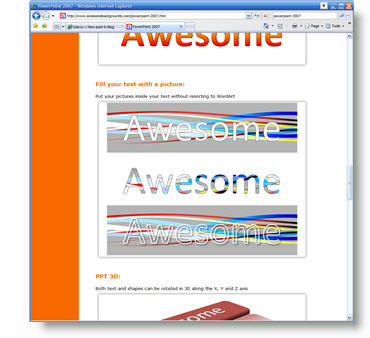 The great thing is that gradient fills can also be applied to select text within one text box. For design purposes on this one, I reversed the gradient so the top text goes from dark-to-light and the bottom text is the reflection of the gradient going from light-to-dark. And again, all of this remains editable text too. There is a lot of design potential with this feature! Outline and Glow Per Word – Absolutely! Just like the drop shadow to select text in the same text box, we can also now add outlines and glows! Here I have added a nice bold red outline to one key phrase and a blue glow to another key phrase – all within the same text box. One of the frustrations of earlier versions was that drop shadows were applied to all or none in a text box. Fortunately PPT 2007 solves that limitation! 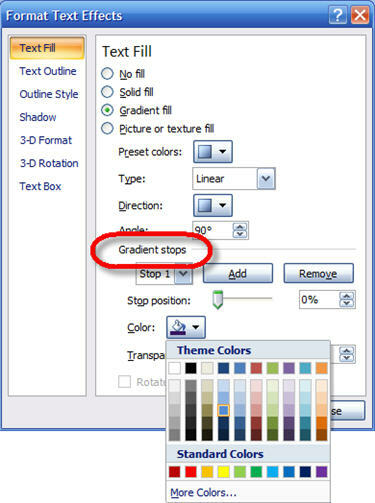 As example, PPT 2003 you cannot apply a drop shadow to just one word – here I want to apply the yellow drop shadow to just certain words … can’t be done. 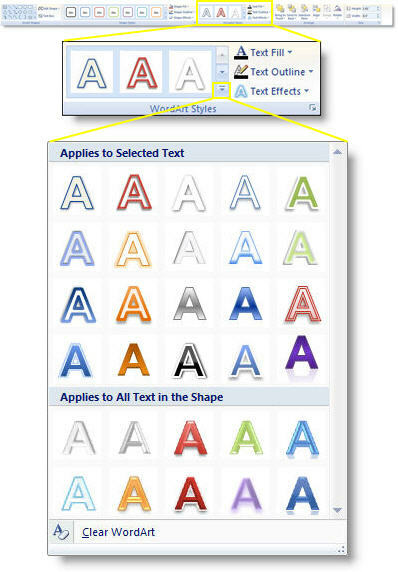 With previous versions select words could be a different color, font or size. With PPT 2007 the same is true and now to an even greater degree. Several of the new visual effects can be applied to select words in the same text box. As example, here I have selected a few key words and given them a multi-colored gradient fill. 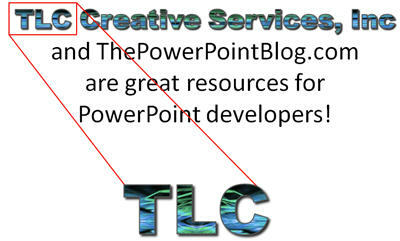 This sample is standard text I typed in and then applied visual formatting to – these new capabilities have opened huge design options within PowerPoint! 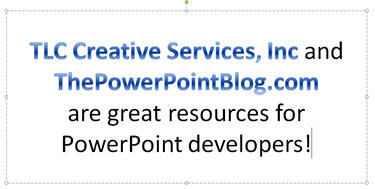 PowerPoint 2007 has been out for a while now and I have finally caught up with things. Actually I have spent the past months working extensively in it. To be honest, my list of “issues” is really long, but those annoyances almost balance out with my list of praises. Over the next few weeks I have cued up dozens of examples of the visual effects possible with PPT 2007 as well as many real slides and some tips on maximizing the new capabilities!